Animals impact our world – and us – everyday, in countless ways. Here, find 33 stories told by people who have felt incredible connections with their animal companions. See how children with autism have found saviors in their animal friends in ways that positively affected their disability. Swim with dolphins, as one artist did, to find the meaning of life. Run with the Speedwell Wolves, housed in a Pennsylvania sanctuary to learn how people/animal associations are not always wise. Visit with the Dolly Llama, mistress of a petting zoo, to find that she is not just another pretty face. Go to Gettysburg for a dog's last hurrah. Find out about cat ladies, a dog who rings for service, an amazing escaping rabbit, and what it's like to interact with a butterfly. Included are instructions for you to become an animal communicator, pendulum, animal healing guidance, and information about pet grieving – not yours, but your pet's! Animals are making an impact! Now you can make an impact by connecting with them! ...Animals Impacting the World (Schiffer Publishing 2012) contains 33 stories told by people who have made that special connection with their incredible animal companions. It has been found that children with autism have excelled in positive ways with their animal friends. Learn the connection between ‘cat ladies’ and their menagerie of what they often call 'their children'. Dinah Roseberry and Mary Gasparo, pursuers of the paranormal and animal communicators, provide the readers with a chapter of getting to know your specific animal guide for communication. An animal spirit guide can be any creature from a tiny butterfly to a gigantic elephant. Different creatures are available to communicate to various essentials of the one in need. Some paranormal investigators bring along a ghost tracking dog—maybe not as clever as Scooby-doo—but productive in acknowledging the presence of a spirit or unseen energy. The chapter titled ‘A View of the Otherside’ gives readers an insight in the ways animals may connect to the other world. Roseberry and Gasparo give instructions for the reader to become an animal communicator, pendulum animal healing guidance, and information about pet grieving –not yours, but your special pet! Put a copy of “Animals Impacting the World” in your ghost hunting library and use it as another one of your ghost hunting tools. Listen to an interview with Paul and Ben Eno on the famous Behind the Paranormal radio show with me at the below link! What do pets, ghosts, and mysteries have in common? Spirit and questions about the "otherside." Through the world of animal communication and ghost hunting, learn the ropes of talking to pets and ghost animals. Spend time with a Hollywood bird that keeps company with a Mafia ghost. Meet a frustrated dog in Pennsylvania trying to return to her mistress after death. Feel the suffering of one cat who gives her life to save another. Meet an intelligent horse who has all the right jokes, and another whose life revolved around "work." The author "does the good work" with a Connecticut ghost hunter's deceased cat and sees a rock creature from another dimension. Laugh, cry, and be creeped out as you follow ghostly antics of this author-turned-animal communicator. Farfetched? No; you can do it, too! Let her show you how! The author also provides an easy to understand pet communication method that anyone can practice. You can discover whom your personal spirit animal is that stays with you throughout your lifetime. Roseberry said it was her favorite to write, and you can feel her enthusiasm in this immensely engaging book. It is delightful to see the range of personalities displayed in the pets Roseberry meets. Bentley is a crotchety cockatiel who speaks his mind. Solo the horse plays pranks that most would call something stronger than a prank. Other pets are more demure in their language and behavior. Written in conversational style, this is a fun book for customers who love animals. This book takes you on an incredible journey where few people have traveled. I think most humans agree that animals know many things that are about to happen before humans know. They can, and frequently do, exhibit unusual behavior before major storms, earthquakes, tsunamis or hurricanes and if they are not confined, they will try to seek safer ground. But, this author and animal communicator shows us that this is just the tip of the iceberg from a psychic standpoint. You might think most animal communication would be with one’s pet, but that is not the case nor is it confined to just pets. Many of the experiences that are shared in Psychic Pets are with some very unlikely candidates, such as horses, birds and even snakes ... There were two occurrences in the book that I will never forget. One was the impression from the author’s dear friend’s dogs that they knew they were going to lose their owner several days before his death. This seemed to be a very powerful and moving experience for the author. It touched my soul. The second was an animal “Walk In”. Many of us who have had a paranormal interest have heard or read about soul “Walk Ins” in humans, but I did not know animals could experience this type of interaction...If you love animals and have an interest in psychic phenomena, “Psychic Pets – Solving Paranormal Mysteries” is a must read. Dinah Roseberry is an excellent writer and mixes a great sense of humor into a delightful, yet serious, book. unique culture and stormy history by exploring sixty ghostly accounts of creepy places, non-living people, and paranormal phenomena. Nestled at the southern tip of New Jersey, beautiful Cape May is the perfect historical backdrop for some very ghostly haunts! Psychic Laurie Hull gives her impressions of Cape May’s top beach sites and interacts with its ghostly past. Meet talkative ghosts at Elaine’s Haunted Mansion and learn the heartwarming story of a child ghost who lingers with today’s patrons. Consider exploding glasses at the Southern Mansion. Visit a speakeasy ghost at the Queen Victoria Bed and Breakfast. These and other ghostly Cape May beach tales will chill you to the bone! 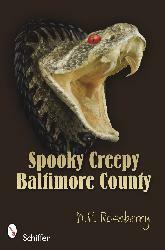 Come closer to the flames as you read the contemporary campfire haunts of spooky, creepy Baltimore County, Maryland. Learn how a love spell goes terribly wrong for a Parkville woman —or maybe it worked too well… Cringe as you hear about the bloody destruction of the police communications department in Towson. Feel the horror of murder at a flower shop in Reisterstown, when a premonition came too late to save a woman. Hear demons in an attic at a Harford Road residence. See shadow people in Perry Hall, and meet a murderous ghost in Middle River who haunts a basement waiting for a victim. These new and scary stories will have you reading into the night—or at least until the fire dies! Make a ghostly tour of York, Pennsylvania, to learn about myths, legends, and ghost stories that haunt this historic town! Visit ghosts at the Goodridge House on a stop at the Underground Railroad or a ghost rider at Crispus Attucks Learning Center’s playground. 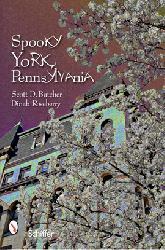 Relax with ghosts George and Martha at York Little Theater or a cigar-smoking spirit at the Strand-Capitol. Be prepared to cringe as you learn about the great cannibal trial at the York County Judicial Center or bats at Junior Achievement! Whether witchcraft, murder, or the gates of hell, York has the haunts for you! Use this paranormal tool kit to spark intuitive abilities and link them to scientific research. It offers assistance with client interaction, member recruitment, and paranormal research by using four 22-card decks designed specifically for ghost investigations and paranormal studies. See how intuition and brainstorming techniques can be used by your team to answer questions that can help solve cases. Get more information from your clients, find the right members for your group, and make EVP or ITC sessions more successful as you conduct your investigations. Included are dowsing rods to further enhance divination skills and a ghostly version of the Major Arcana Tarot. If you're new to the paranormal field, try your hand at starting your own team with this easy-to-follow kit! "What an interesting approach to ghost hunting! Many groups avoid psychics because they want to be as scientific as possible and having a psychic on the team makes group members (and often clients) feel the results will be “tainted”. If the psychic uses a deck (tarot or whatever), there may be religious objections as well. Really, how “scientific” are ghost hunts? Yes, groups use scientific equipment, but can the equipment empirically prove ghosts exist and a location is haunted? Can another tool—a deck of cards or set of dowsing rods—help explain paranormal events at a location? The book with the kit is exceptionally well written and helpful. Dinah Roseberry clearly explains that the cards “are a method to open one’s mind and to connect left and right brain thinking.” Being totally left or right brained is counter productive. I’ve seen ghost hunting group members so closed-minded about anything “non-scientific” that I wonder if they’d know a ghost if they met one. So what are the cards and how can they help? There are four decks, labeled Client, Recruitment, Investigation and Major Arcana. Stuart Schneider’s photos on the cards are of cemeteries, some famous and some not. They are wonderfully evocative. The Investigation deck is used before, sometimes during, and after an investigation. In this deck, Trap warns “Stay alert…Violence or ghost attachment possible.” Change warns that “Severing a connection between client and other side may not be welcome.” Good things to know. The Client deck can help clients remember things beneficial to your team. It’s used when interviewing the client—over the phone when setting up a meeting, or at the meeting itself—and at the conclusion of the investigation. Final Decision warns, “What outcome does client want? How does it compare to what is?” Very good to know—the client might want an outcome totally different from what your team finds. The Major Arcana deck is related to tarot. The Hermit (“Seeking Truth”) advises that the haunting entity might be intimidated by your equipment and unable or unwilling to communicate through it. Very helpful! The dowsing rods can help entities give “yes” or “no” responses to your questions. This isn’t a “play” kit; it’s a serious tool for ghost hunters, and I encourage you to use the book, decks and dowsing rods to see how they work for yourself. The book is easy to read, full of fascinating and helpful information and suggestions. The kit is a tool as necessary and viable for ghost hunting groups as your EMF meter, cameras and digital recorders.